These products are featured in our 2015 Holiday Gift Guide. Nothing quite celebrates the feeling of the holiday season like an engrossing and wonderful book. Grab the kids, a cozy blanket, some hot chocolate and get ready to be charmed by The Night the Lights Went Out on Christmas by award-winning singer-songwriter Ellis Paul. Paul’s second children’s book tells the story of Christmas Block, a neighborhood renowned for its cacophony of decorations as families compete to have the biggest and brightest display each season. One year, however, they take it one Christmas light too far and blow out the power for the neighborhood, then the country, and then the entire world! What could be a disaster turns into a blessing in disguise as the neighbors realize the universe has been putting on a light show of its own, and are reminded that it’s the simple joys that truly make the holidays magical. Richly colored illustrations grow brighter and brighter as more lights join the fray with every turn of the page and young readers will delight in spotting new decorations in each vibrant image. Based upon Paul's song of the same name, this read aloud is a funny, sweet, modern fable about seeing beyond the sparkle and finding the true joy of the season. Ellis Paul is a critically acclaimed singer, songwriter, poet and troubadour. He is the recipient of fifteen Boston Music Awards, second only to multi-platinum act Aerosmith. Since launching from Boston, Ellis has built a vast catalog of music, which weds striking poetic imagery and philosophical introspection with hook-laden melodies. He averages 150 shows a year and travels across America and Europe, playing venues from church basements to Carnegie Hall. The Rock and Roll Hall of Fame invited Ellis to pay tribute to his hero Woody Guthrie, who has influenced and inspired Ellis in a profound way. 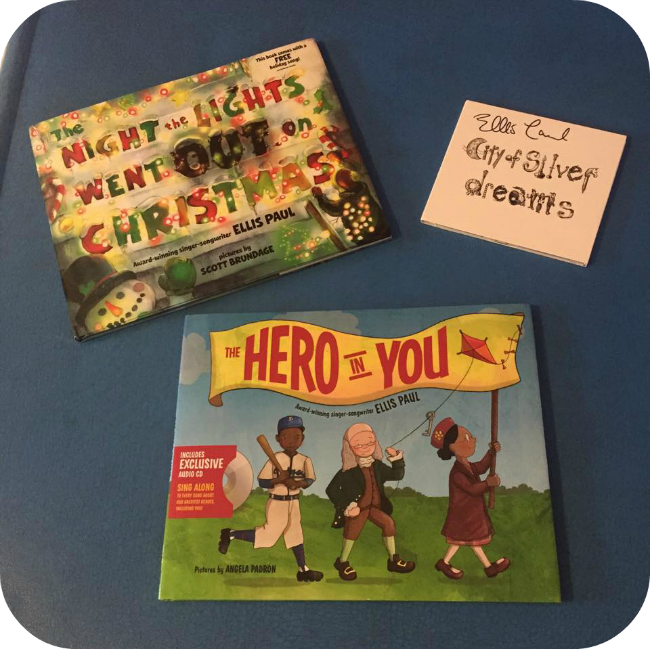 One lucky Nanny to Mommy reader will win a receive a copy of The Night the Lights Went Out on Christmas, a signed copy of Ellis Paul's Holiday CD "City of Silver Dreams", and a copy of his first children's book "The Hero in You". RV $52. Entry is simple, just follow the prompts on the Rafflecopter below. Open to US only, must be 18+ to enter. Winner chosen via Random.org through Rafflecopter. All winning entries are verified. Please follow us on Facebook to stay up to date with our current giveaways. Check out other featured products in our Holiday Gift Guide and Good luck! Nanny to Mommy received complimentary products to provide this review. All opinions are our own. Nanny to Mommy and participating bloggers are NOT responsible for prize fulfillment. This giveaway is open to US only, must be 18+ to enter. One entry per household/IP address. No social media was involved in this giveaway in any way. Winner is chosen via Random.org through Rafflecopter. ALL winning entries ARE verified. Winner will have 48 hours to respond with all information in email or another winner will be chosen. If you would like to see your product featured in our Holiday Gift Guide or sponsor a giveaway event, please contact us. I would give this to my son!! We love reading together and he is just so in love with Christmas!! I would give this to my 5 year old granddaughter. Her big sister (turns 10 years old in 2 weeks) can enjoy it with her and read it to her. IF I win, I don't know yet which grandkid to give this too. They LOVE to read & be read too!! I would love to read this to my daughter! She is very excited about Christmas this year, gives her something to look forward to while dad is deployed! If I won, I would give this to my daughter; she is loving everything Christmas now! It would be for my nephew he would love it. This would be a great gift for my granddaughter. This would be for my son for some new books for his therapist and I to read to him. I would give these to my six year old son. He loves reading! If I won, this would be great for my niece! !